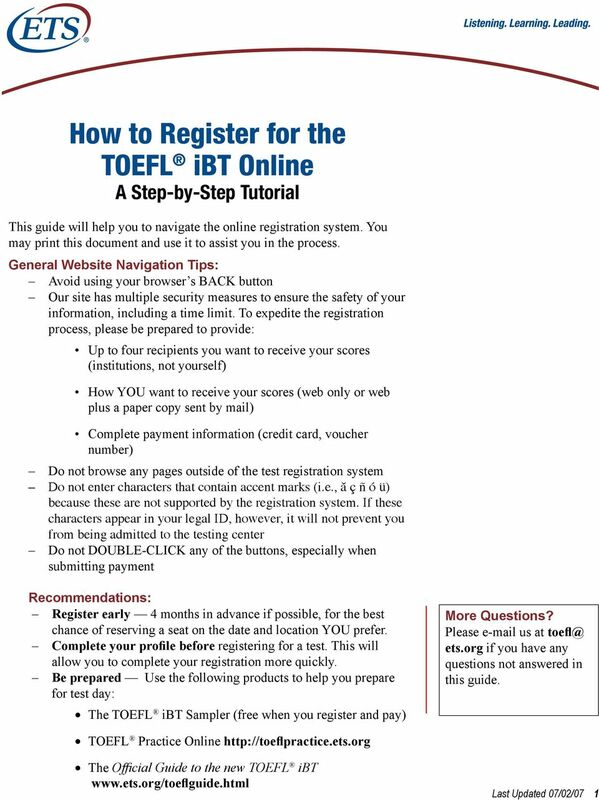 Download "How to Register for the TOEFL ibt Online A Step-by-Step Tutorial"
2 TO REGISTER FOR THE TOEFL ibt Online FOLLOW THESE STEPS TO SAVE TIME Step 1: Login New users click the Sign Up link to create your profile. 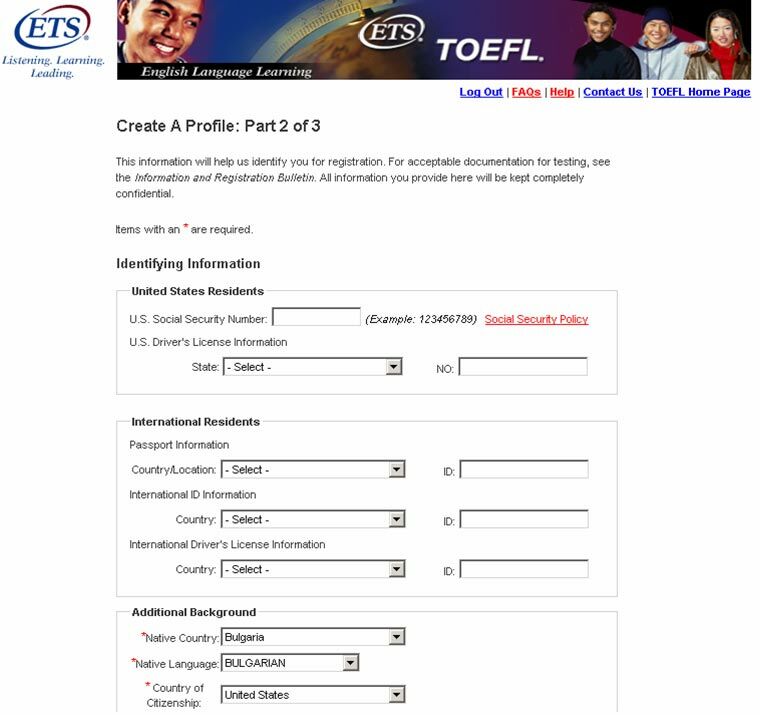 (A new user is anyone who has not created a profile in the TOEFL Internet-based test (ibt) registration system, either online or through a call service representative). Returning users PROCEED TO STEP 3 in this guide. Note: Important registration announcements can be viewed here. Step 2: Create a profile Part 1 Complete all of the required sections highlighted with an asterisk (*). The information you provide will be kept completely confidential. The spelling of your name must exactly match the name printed on the identification document(s) you will present at the center. 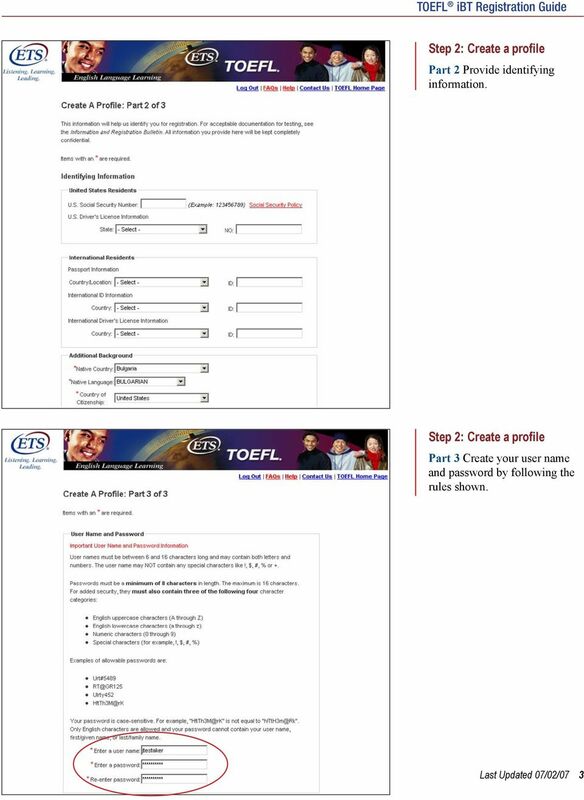 3 Step 2: Create a profile Part 2 Provide identifying information. 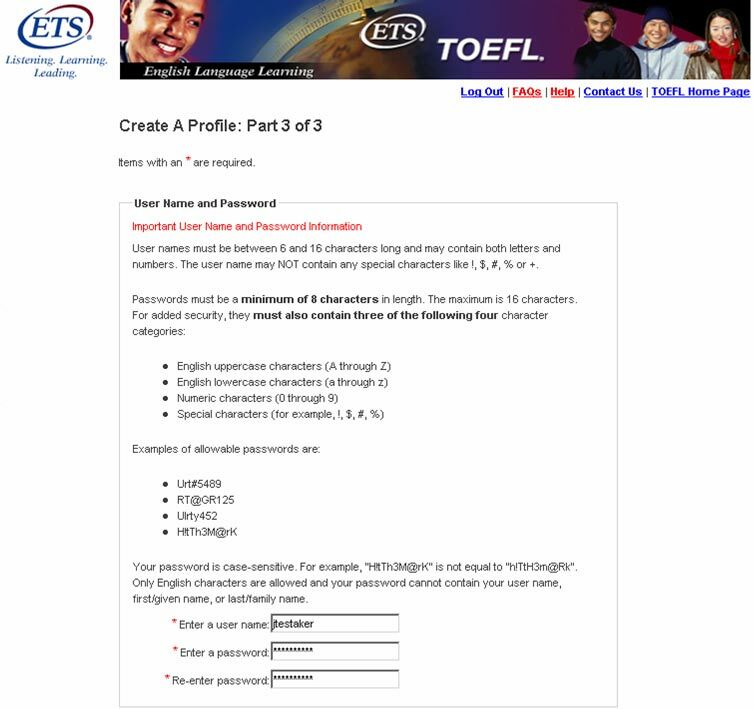 Step 2: Create a profile Part 3 Create your user name and password by following the rules shown. 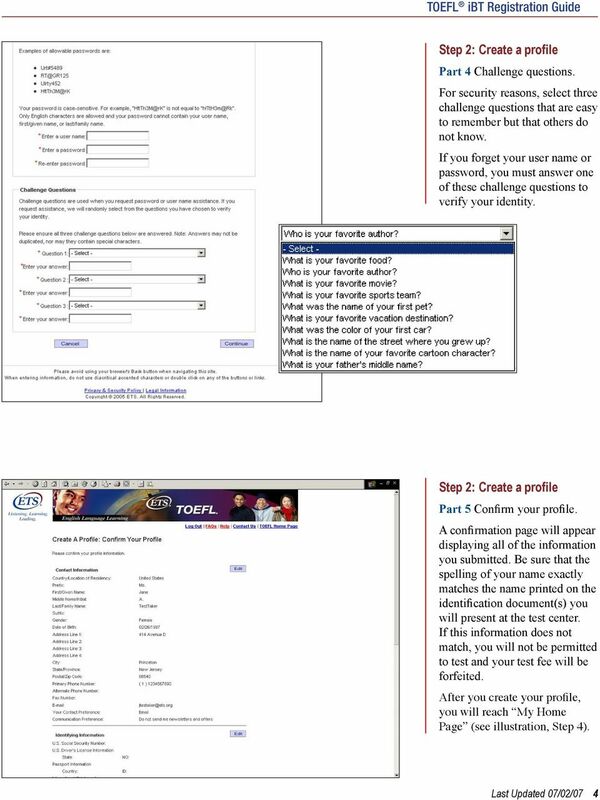 4 Step 2: Create a profile Part 4 Challenge questions. 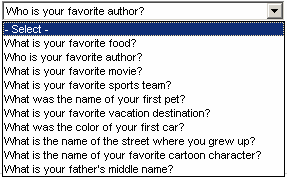 For security reasons, select three challenge questions that are easy to remember but that others do not know. 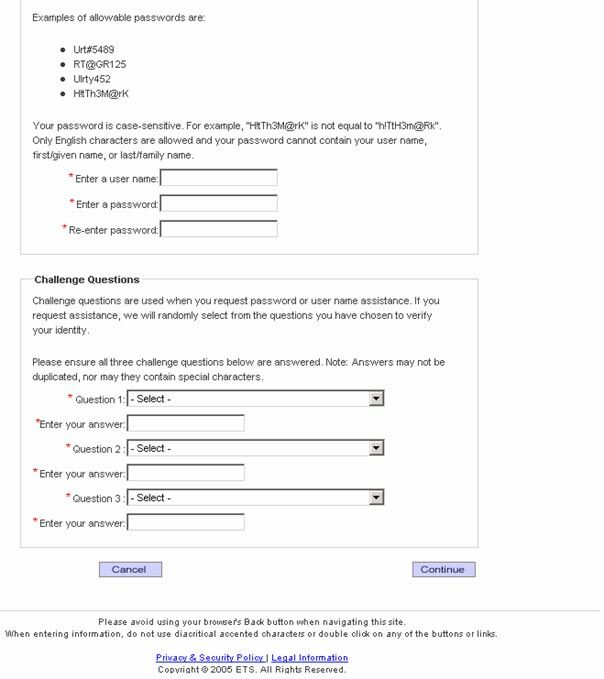 If you forget your user name or password, you must answer one of these challenge questions to verify your identity. 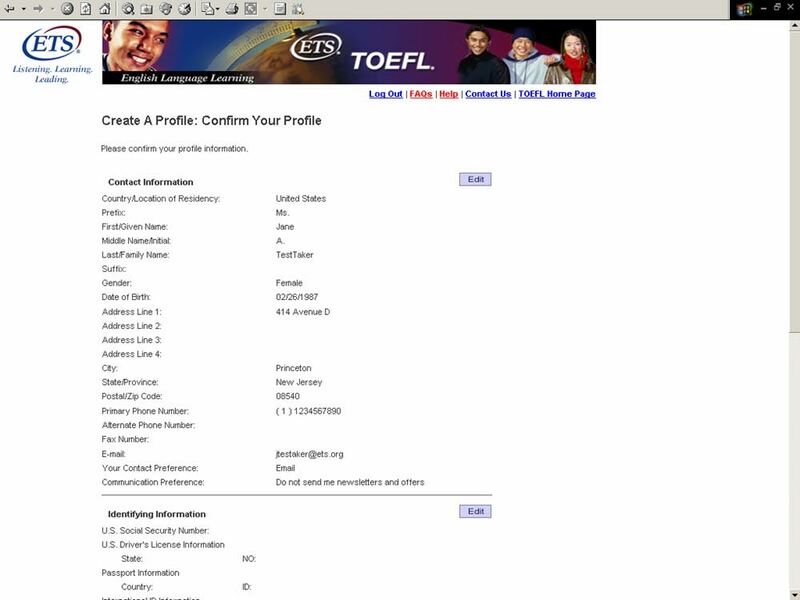 Step 2: Create a profile Part 5 Confirm your profile. 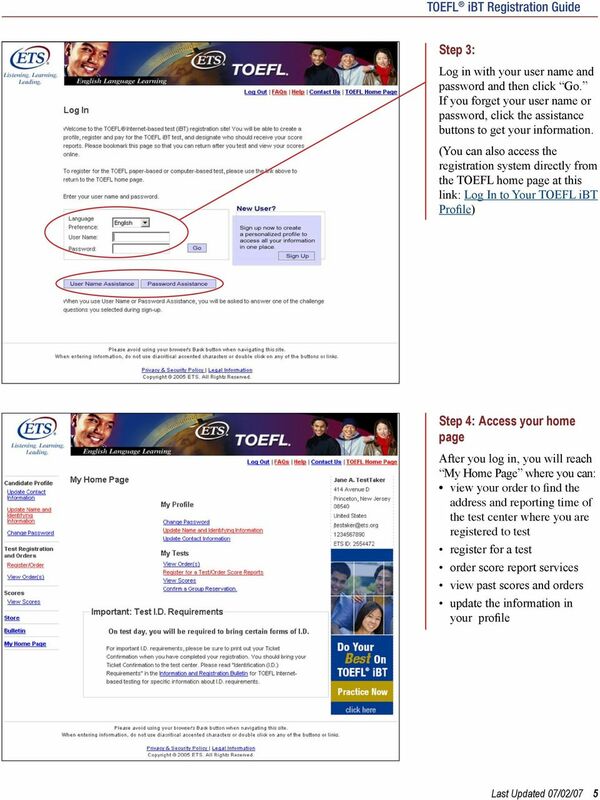 A confirmation page will appear displaying all of the information you submitted. Be sure that the spelling of your name exactly matches the name printed on the identification document(s) you will present at the test center. 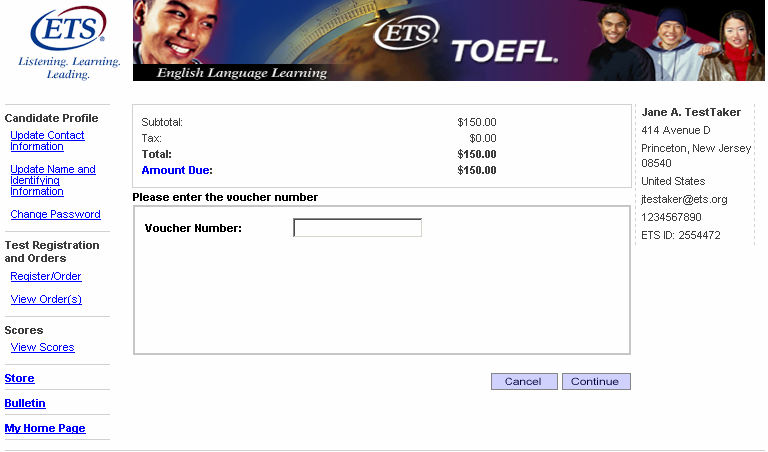 If this information does not match, you will not be permitted to test and your test fee will be forfeited. 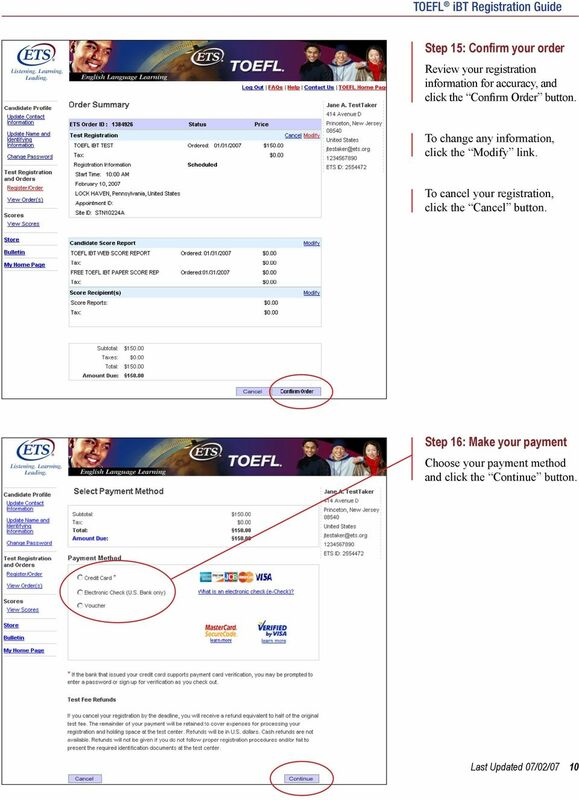 After you create your profile, you will reach My Home Page (see illustration, Step 4). 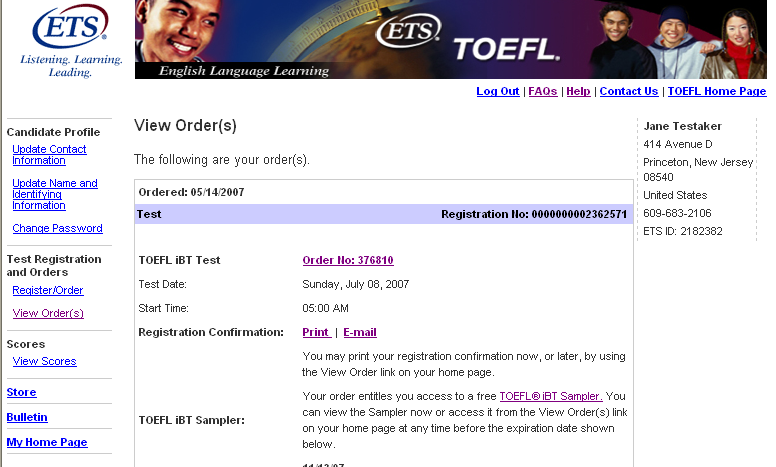 6 Step 5: Under My Tests, click the Register for a Test/Order Score Reports link. 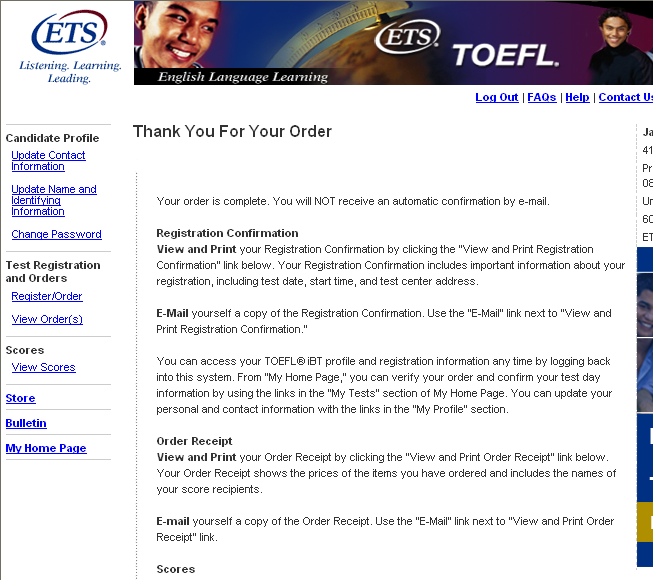 Step 6: To register, click TOEFL Test and then the Continue button. 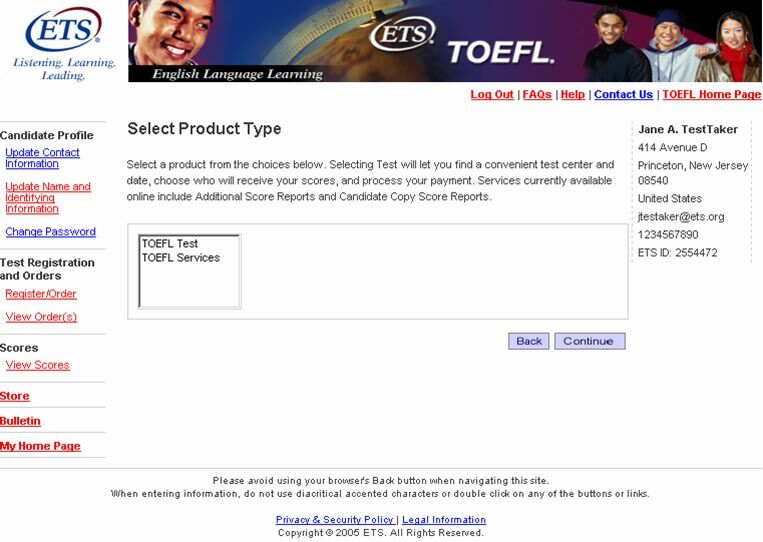 If you want to purchase more score reports (those in addition to the four FREE score reports you get when you register for a test), select TOEFL Services. 7 Step 7: Read the overview page carefully. To continue, click the I Agree button located at the bottom of the page under the Policy Agreement Statement. 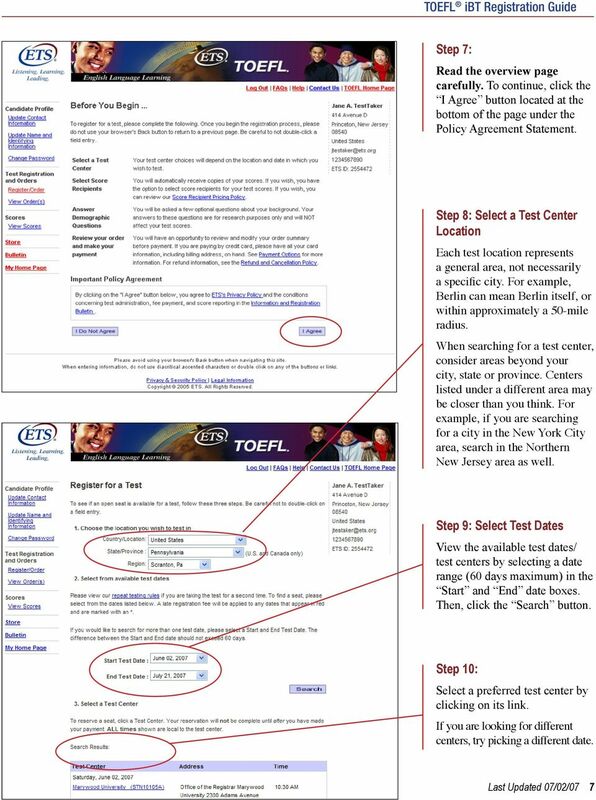 Step 8: Select a Test Center Location Each test location represents a general area, not necessarily a specific city. For example, Berlin can mean Berlin itself, or within approximately a 50-mile radius. 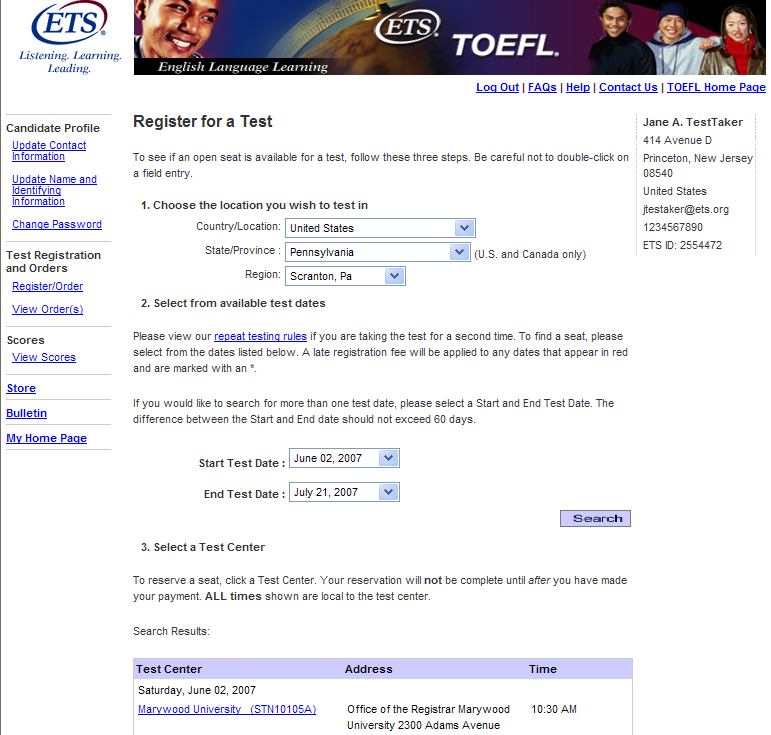 When searching for a test center, consider areas beyond your city, state or province. Centers listed under a different area may be closer than you think. 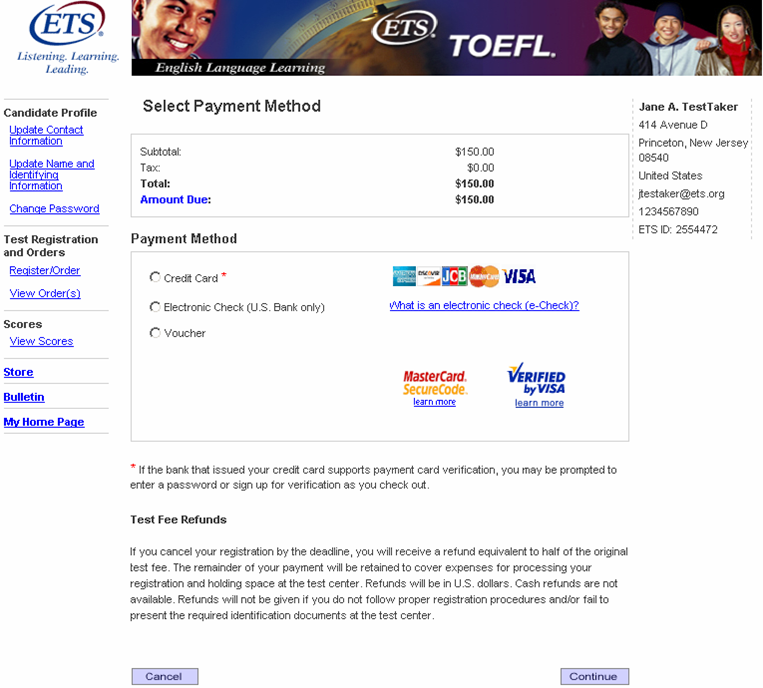 For example, if you are searching for a city in the New York City area, search in the Northern New Jersey area as well. Step 9: Select Test Dates View the available test dates/ test centers by selecting a date range (60 days maximum) in the Start and End date boxes. Then, click the Search button. 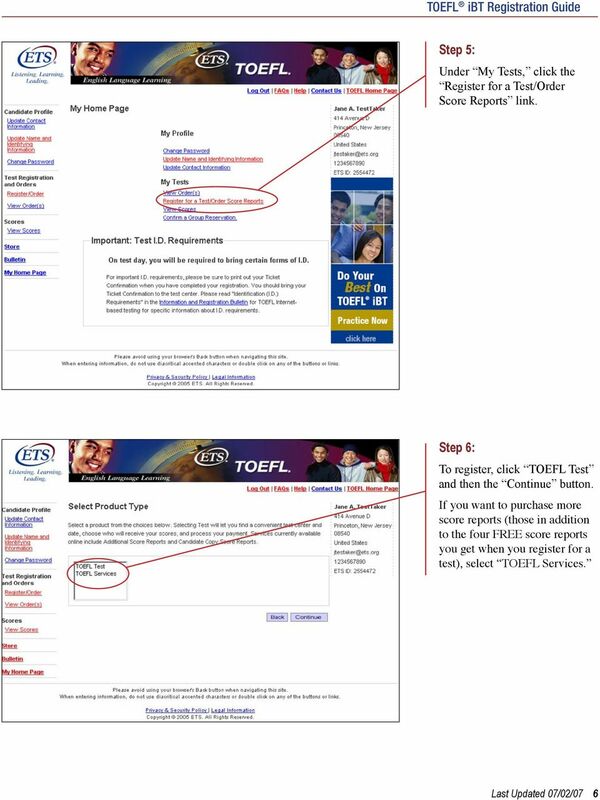 Step 10: Select a preferred test center by clicking on its link. If you are looking for different centers, try picking a different date. 8 You will have a maximum of 20 minutes to complete Steps 11 through 17. 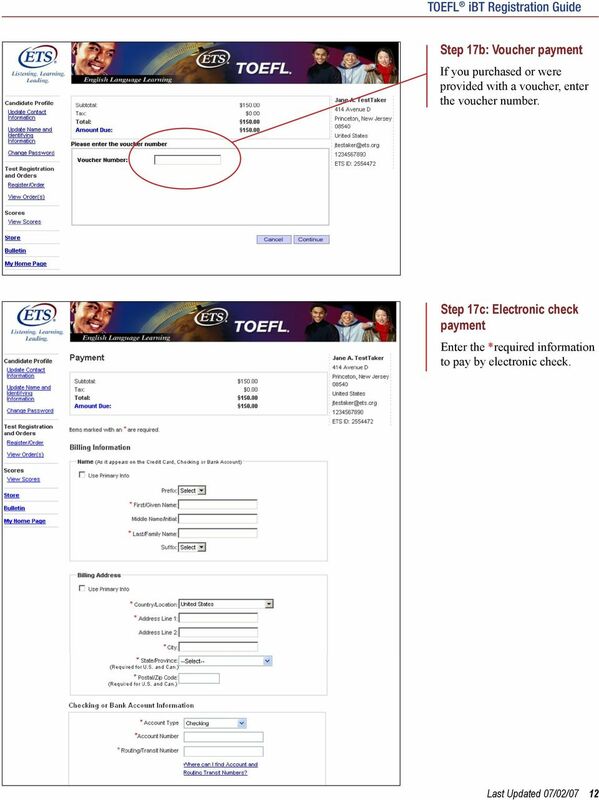 Step 11: Confirm your registration A Reservation Summary page appears. If the information is correct, click the Continue button. If incorrect, click the Cancel button to perform another search. 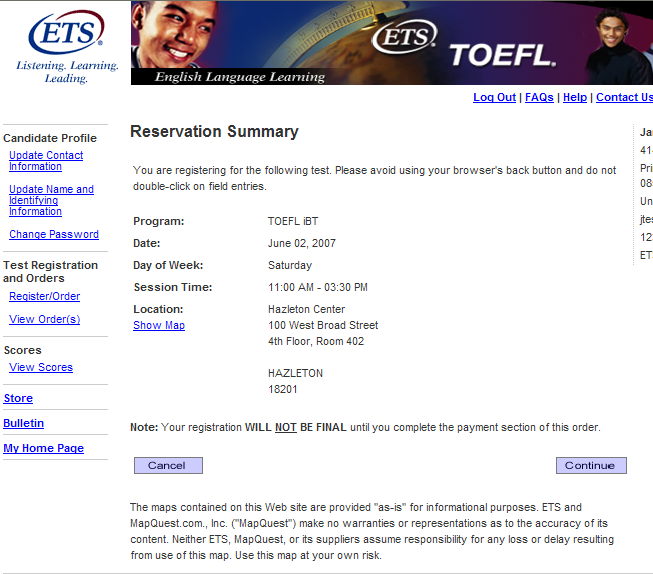 NOTE: Your reservation is not confirmed until you pay for the test. 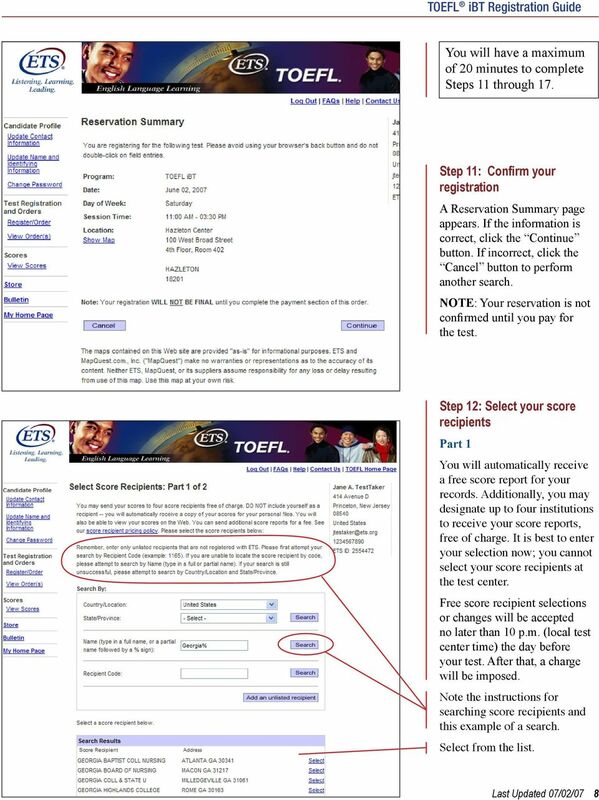 Step 12: Select your score recipients Part 1 You will automatically receive a free score report for your records. 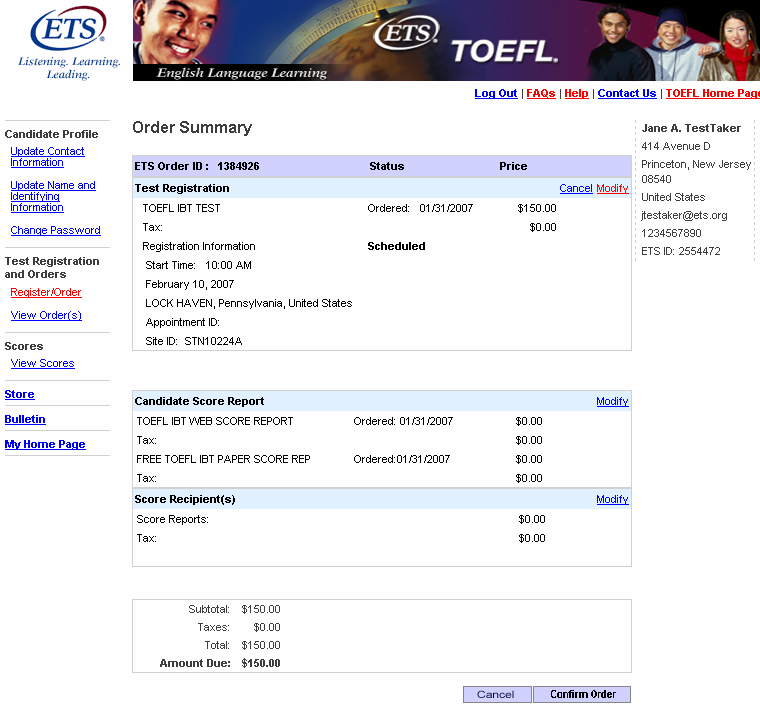 Additionally, you may designate up to four institutions to receive your score reports, free of charge. 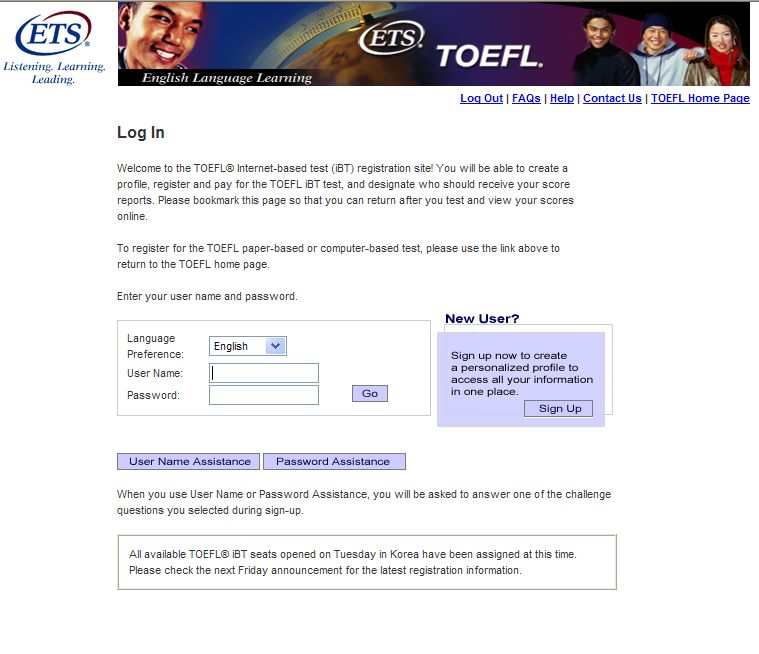 It is best to enter your selection now; you cannot select your score recipients at the test center. Free score recipient selections or changes will be accepted no later than 10 p.m. (local test center time) the day before your test. After that, a charge will be imposed. 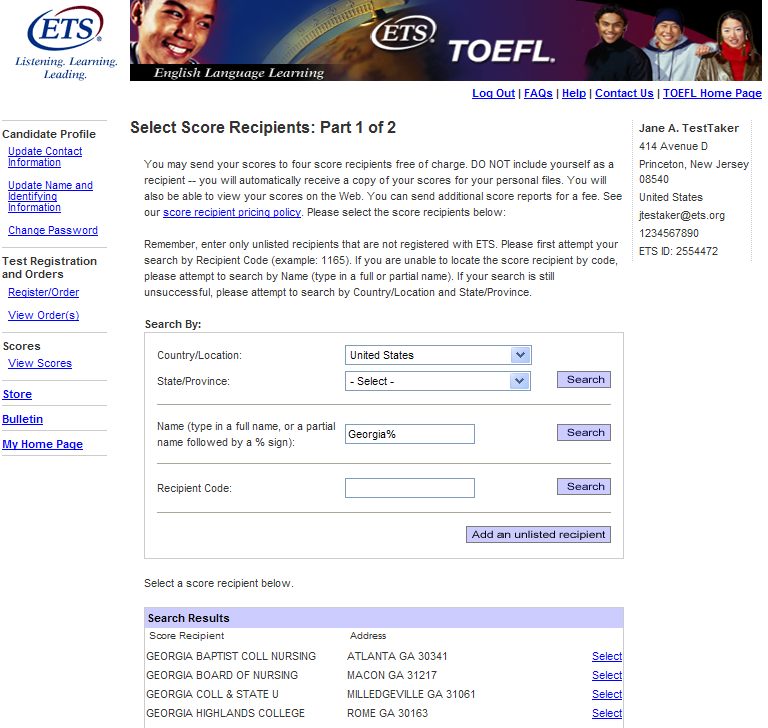 Note the instructions for searching score recipients and this example of a search. Select from the list. 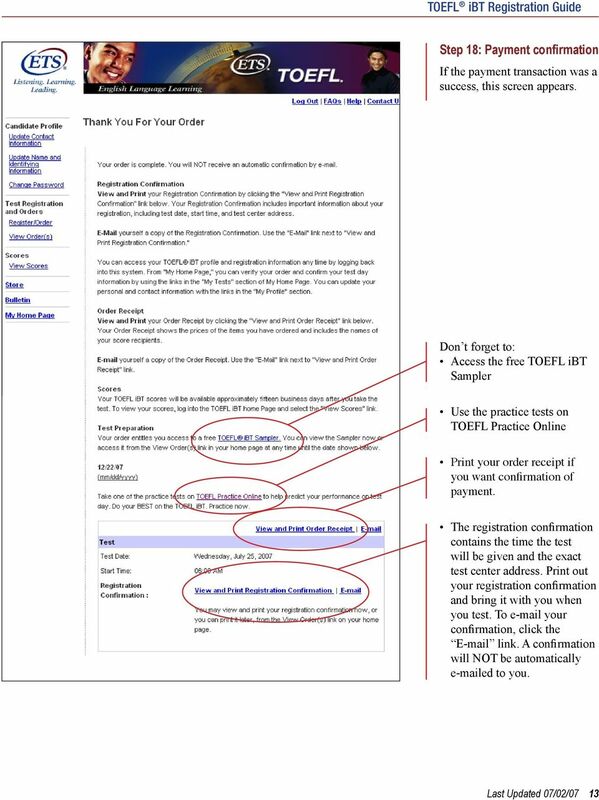 9 Step 12: Select your score recipients Part 2 Verify your selected recipient and select, if applicable, a department. 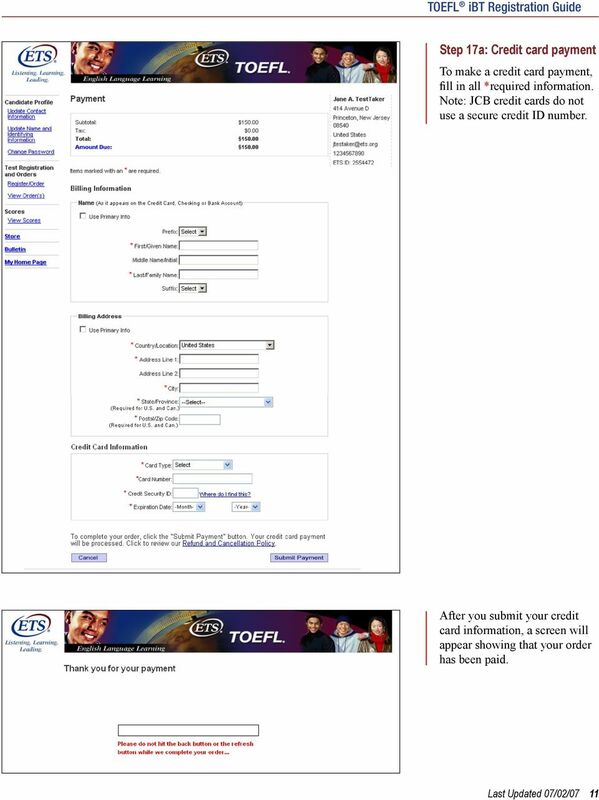 Then you can either choose to add another recipient or continue with the registration process. 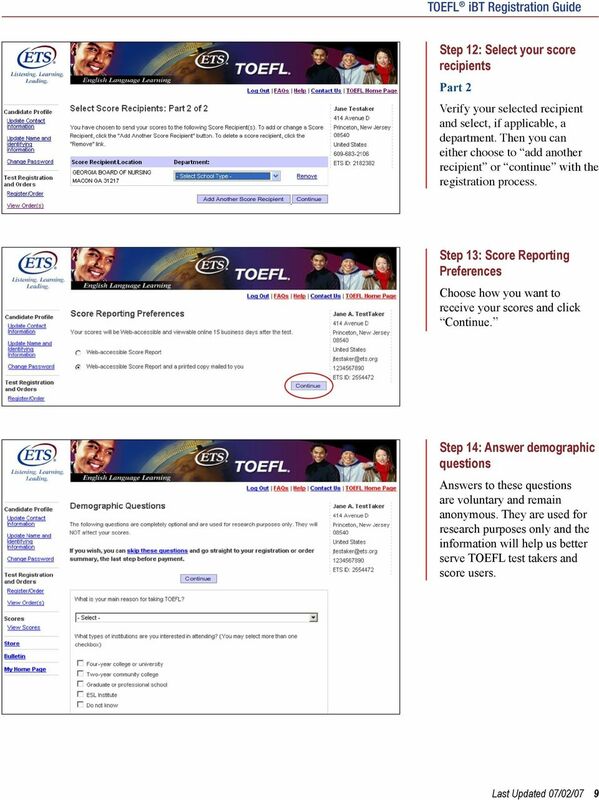 Step 13: Score Reporting Preferences Choose how you want to receive your scores and click Continue. Step 14: Answer demographic questions Answers to these questions are voluntary and remain anonymous. 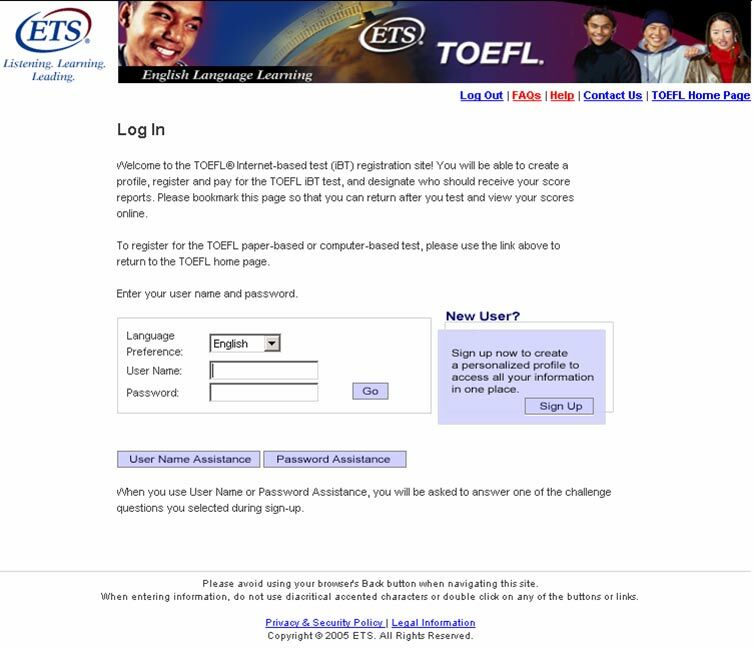 They are used for research purposes only and the information will help us better serve TOEFL test takers and score users. BULLETIN. 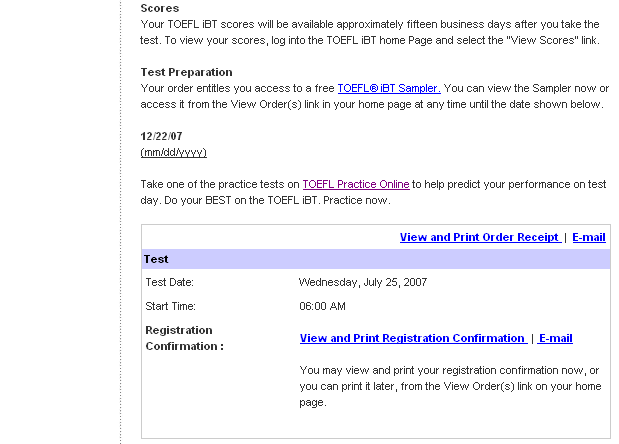 Test of English as a Foreign Language. 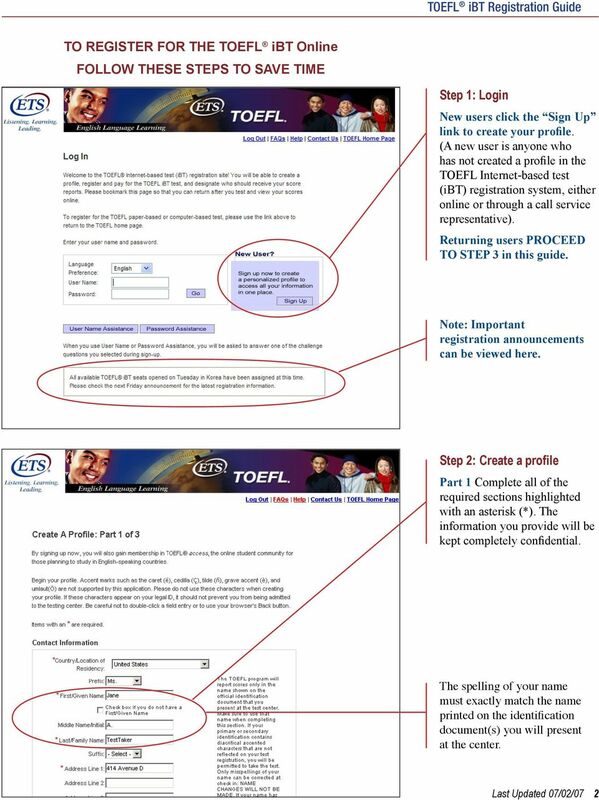 TOEFL ibt. Information and Registration FREE COPY. 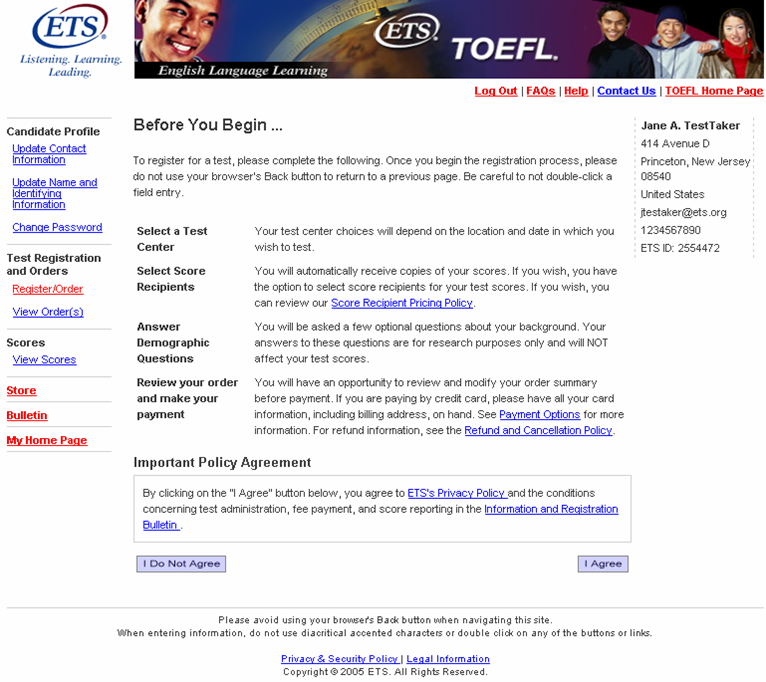 for Internet-Based Testing (ibt) www.ets. 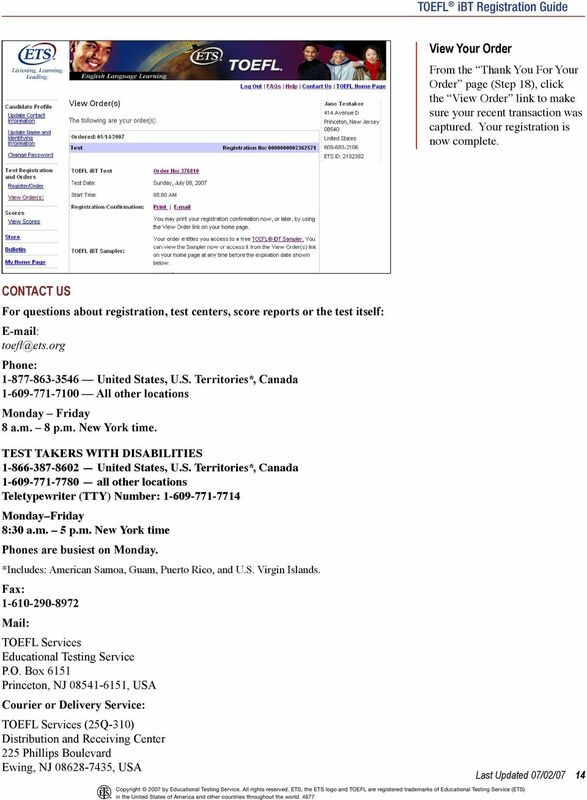 The My Bidx Page. 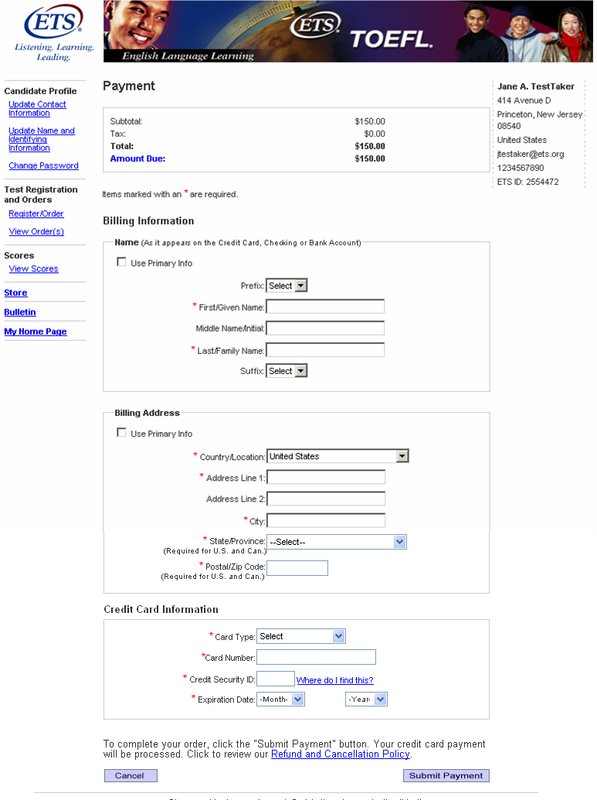 Settings and Services, Billing Information, and the Bid Express Small Business Network. January 2014. 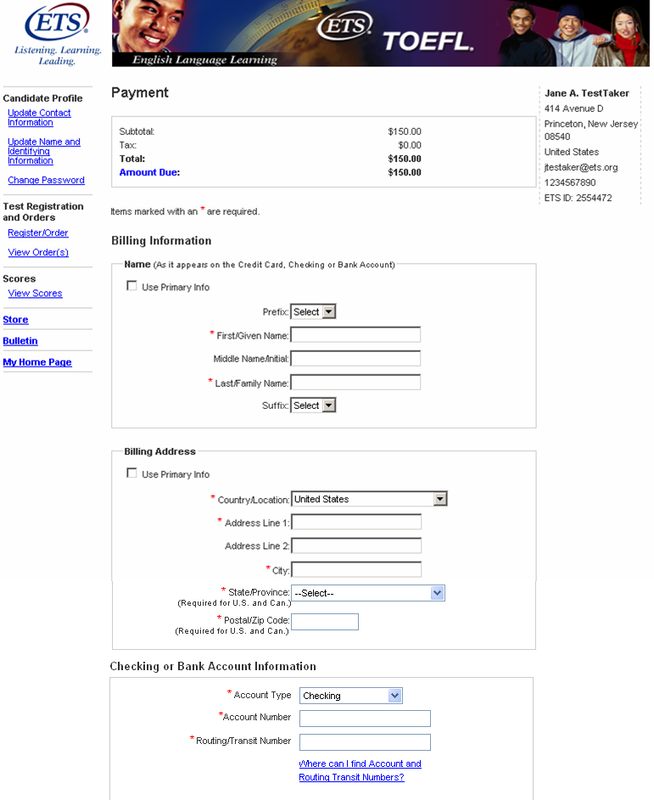 Online Systems at COTR. Learn about COTRs Online Systems, how to log into them, activate your accounts and set up your passwords. Home School Information. This information is for those students who have attended a home school for all or part of their high school career. This information is for those students who have attended a home school for all or part of their high school career. What is Home School? Learning at home does not necessarily equate to being home schooled. Welcome to CompanyBlue by JetBlue. This document is intended to provide employers/recruiters with a basic overview and users guide of the Employer/Recruiter section of the job board.